Saturday, July 18 – Hey everyone, it’s Mandi with a practice update. Tucker just finished his two practices for the day. He said he felt “pretty good.” His lap times in both practices were right around 20 place. With the two practices combined, he ended up with the 21 fastest lap time. That gives him 21 pick for both motos. Like I said in my Red Bud update, he generally finishes ten positions higher in the motos. That would put him close to the top-ten and his goal this weekend is to finish inside the top-ten. Tucker did press day yesterday and signed autpgraphs at Fan Fest last night. Press day a great opportunity to talk to the local and industry media and as a bonus he was able to ride the track for 20 minutes. Fan Fest was a huge hit last night. It’s a free event the evening before the Nationals. He signed autogtaphs under the FMF tent and went through over 200 posters! After he ran out of posters, he signed whatever fans would give him. I think I even saw him sign a little girl’s Hannah Montana hat! He had a great time seeing some familiar faces and visiting with his local fans. Below are a couple photos from last night. 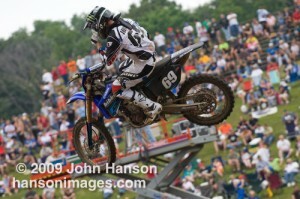 His first moto starts at 2 p.m. Make sure to log on to www.allisports.com to watch it live! Here’s your chance to spend a day riding and training with Tucker! On Sunday July 19, Tucker, along with his friends Andrew Short and James Polvony, will be at Elk River Extreme Motor Park to help YOU become a better athlete on and off the track. Don’t miss your chance to train one-on-one with Tucker and to experience a life changing truth what will inspire you to ride harder, faster and with a new purpose! For more info. and to register online go to www.erxmotorpark.com! Hey everyone, it’s Tucker. I wanted check in and give you an update on my mountain bike racing. This summer I’ve been racing at Buck Hill in Burnsville, Minn. I’ve been able to race six of the eight races so far and am having a blast. Penn Cycle puts on the races and it’s a great opportunity for the whole family to hang out. It’s been a nice break from racing, even though it’s still racing! Mandi, with the help of Mellow Johnny’s (Lance Armstrong’s bike shop in Austin, Texas), hooked me up with an awesome bike for my birthday – check out the photos on my website. I’m just getting used to it but am already noticing huge improvements. This past week I finished 13. It was my second best finish and my second race with my new Trek. I haven’t made any changes to the bike but plan on switching out the suspension for Fox Racing Shox and might change the tires. I’m learning a lot about bike set-up and how much it can make a difference. I guess it’s just like any other type of racing. I’m going to skip Buck Hill this week because the Spring Creek motocoss national is this weekend. After this weekend, I have a three-week break from racing motocross so I should be able to get in more mountain biking. My goal is to continue to improve each week and hopefully tighten the time gap between the leader and I. It’s a new sport to me so I’m learning something new everyday. I love it and am completely addicted. Good thing Mandi likes riding too. She hasn’t raced yet but is signed up for the Short and Fat at the Chequamegon Fat Tire Festival in September. It’s a 16-mile race that both Mandi and my best friend Rob are racing. I’ll be in the 40-mile race with my buddy John. I raced it for the first time last summer and it was the gnarliest race I’ve ever been in. Sometimes I wonder why I signed up again! Okay, back to work. There’s a lot of stuff to get done for this weekend. If you’re in the area, I hope you plan on being at Spring Creek in Millville, Minn on Saturday. It should be a great race! 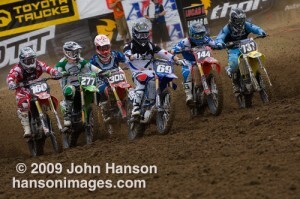 Moto 1 Start. Three guys from MN and one from ND: #309 Dally, #69 Hibbert, #144 Martin and #737 Reidman. Sorry it took so long to check in. I got cought up with packing and getting on the road. Tucker had another good start in the second moto. He ended up 19th on the first lap and by the eighth lap, he had moved up to 15th. He was riding strong and consistantly moving forward. The track was rough. Tucker said it was the roughest he’s ever seen it at Red Bud. The changed the format this year so the 250 class runs after the 450 class. On the ninth lap, Tucker got out of rythem in a sand section – his front wheel jack-knifed and he got thrown over the bars. Uninjured, he jumped up but couldn’t get his bike started. He pushed his bike off the track with the help of his buddy and Asterisk medic, Eddie. Once he got his bike started, he pulled over to the mechanic’s area for fresh goggles an gloves and jumped back in the race. He slavaged a 32nd finish for 19th overall for the day. Tucker said he’s disappointed in his second moto results but still felt like he rode well. Thanks for checking in and enjoy the rest of your weekend! Tucker finished 13th in moto one, which is one of his career best finishes! He had a great start, right around 13th and held his own the entire moto. On the second to last lap, he clipped a hay bail that was in the middle of the track and tipped over. He quickly got up and running again but had lost a position. He put his head down and made the pass at the end of the last lap to finish 13th. Tucker said he felt good and that he’s confident he can have an even better second moto. Log on to www.allisports.com to listen to moto two live! July 4 – Hey Everyone! It’s Mandi checking in with a practice report. First off, Happy 4th of July! I hope everyone is spending some time with their family and friends and celebrating America’s birthday. As always, the track and facility are amazing. Red Bud is a first-class venue and anyone that hasn’t experienced it in person, should. Tucker said he felt rusty in the first practice but by the second practice he was feeling good. It’s not too often that he says he feels good in a moto practice so that’s encouraging news! With the all the 250 practices combined, Tucker is sitting 22nd overall. Typically, he finishes ten positions higher in the motos than in practice so that puts him 12th. His goal is to finish in the top-ten and after practice, he said “it’s doable!” He has a great attitude this morning and is pumped to be back at the races. It’s currently 69 degrees and overcast – perfect racing weather. Tucker said the track “is awesome and has just the right amount of moisture.” There’s a chance of showers this afternoon and by this evening it might turn into thunderstorms. The radar shows the storm south of where we are at so hopefully it will hold off. I’ll make sure to check in after the first moto with an update. You can watch the first moto live on www.allisports.com. The second moto, you can get a live audio feed. 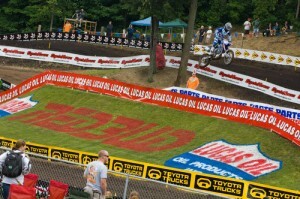 The second 450 moto will be on NBC live with the second 250 moto airing on SPEED Tuesday, July 7. 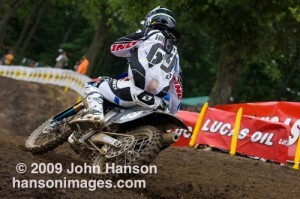 Check out www.allisports.com and www.mxsports.com for more info. Here are a couple photos by John Hanson from Hanson Images. Enjoy!